Stephen Mandel’s 13F portfolio value decreased ~24% from $19.44B to $14.77B. The number of positions remained steady at 25. Lone Pine Capital added Booking Holdings, Mastercard, Tiffany, and Autodesk, while dropping Alphabet, Electronic Arts, and Nvidia. The top three positions are Adobe Systems, Amazon.com, and Microsoft. They add up to ~22% of the portfolio. This article is part of a series that provides an ongoing analysis of the changes made to Stephen Mandel’s 13F portfolio on a quarterly basis. It is based on Mandel’s regulatory 13F Form filed on 02/14/2019. Please visit our Tracking Stephen Mandel’s Lone Pine Capital Portfolio article for an idea on his investment philosophy and our previous update for the fund’s moves during Q3 2018. This quarter, Mandel’s 13F portfolio value decreased ~22%, from $19.44B to $14.77B. The number of holdings remained steady at 25. 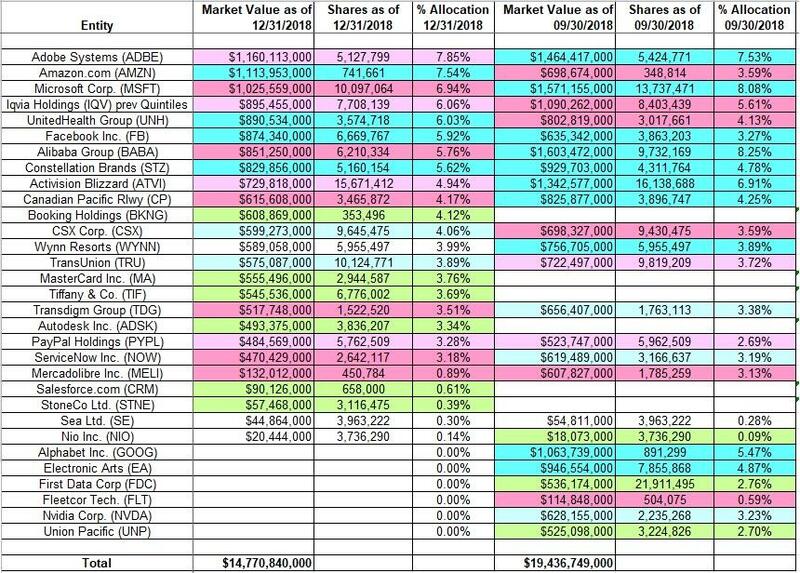 The top three positions are at ~22%, while the top five are at ~34% of the 13F assets: Adobe Systems (ADBE), Amazon.com (AMZN), Microsoft (MSFT), Iqvia Holdings (IQV), and UnitedHealth Group (UNH). Stephen Mandel worked at Tiger Management under Julian Robertson for eight years starting in the late 1980s, making him a bona fide tiger cub. To know more about Julian Robertson and his legendary Tiger Management, check out Julian Robertson: A Tiger in the Land of Bulls and Bears. Booking Holdings (BKNG), Mastercard (MA), Tiffany & Co. (TIF), and Autodesk Inc. (ADSK): These are medium-sized new positions established this quarter. BKNG is a 4.12% of the portfolio stake purchased at prices between $1617 and $1998, and the stock currently trades at $1746. The 3.76% MA position was established at prices between $175 and $224, and it is now just above that range at $226. ADSK is a 3.34% portfolio stake purchased at prices between $118 and $156, and it currently trades at $155. The 3.69% TIF position was established at prices between $74 and $128, and it now goes for $94.87. Note 1: Lone Pine Capital has a 5.5% ownership stake in Tiffany & Company. Note 2: Booking Holdings has seen a previous round-trip. It was a large 5.69% portfolio position established in Q3 2017 at prices between $1790 and $2049, and increased by roughly one-third the following quarter at prices between $1646 and $1942. The position was disposed last quarter at prices between $1825 and $2087. Salesforce.com (CRM) and StoneCo Ltd. (STNE): These are minutely small (less than ~0.60% of the portfolio each) positions established this quarter. First Data Corp. (FDC) and Union Pacific Corp. (UNP): These two new positions purchased last quarter were disposed this quarter. FDC was a medium-sized 2.76% portfolio stake established at prices between $21 and $26 and sold this quarter at prices between $15.50 and $24.50. The stock currently trades at $25.49. The 2.70% UNP position was purchased at prices between $138 and $165 and eliminated this quarter at prices between $128 and $165. It now goes for $167. Alphabet Inc. (GOOG): GOOG was a 5.47% portfolio position purchased in Q4 2017 at prices between $952 and $1077. The stake was increased by ~36% last quarter at prices between $1100 and $1270. The position was sold this quarter at prices between $976 and $1203. The stock currently trades at $1162. Electronic Arts (EA): The 4.87% EA position was purchased in Q3 2017 at prices between $105 and $122, and increased by ~75% the following quarter at prices between $101 and $120. This quarter saw the stake disposed at prices between $75 and $118. It is now at $95.72. Nvidia Corp. (NVDA): NVDA is a 3.23% position purchased in Q2 2018 at prices between $214 and $267 and eliminated this quarter at prices between $127 and $289. The stock is now at ~$157. FleetCor Technologies (FLT): The very small 0.59% FLT stake had seen a ~55% reduction over the last two quarters at prices between $196 and $228. The remaining position was disposed this quarter at prices between $176 and $226. The stock is currently at $231. Adobe Systems: ADBE is currently the largest 13F position at 7.85% of the portfolio. It was first purchased in Q1 2014 and almost doubled the following quarter at prices between $60 and $73. 2015 saw that original stake reduced by two-thirds at prices between $73 and $96. The position has since wavered. In recent activity, Q4 2017 saw a ~50% increase at prices between $148 and $185, while next quarter there was a ~20% reduction at prices between $212 and $258. Last quarter saw a similar increase at prices between $242 and $275. The stock currently trades at ~$257. There was a ~5% trimming this quarter. Microsoft Corporation: MSFT is currently the third-largest 13F position at 6.94% of the portfolio. It was established in Q2 2017 at prices between $65 and $72.50. There was a ~15% trimming in Q4 2017 at prices between $74 and $87, while next quarter saw a ~26% increase at prices between $85 and $97. The stock is now at $112. There was a ~25% reduction this quarter at prices between $94 and $116. Note: MSFT has had a previous round-trip. It was a large (top-five) 4.93% of the portfolio position in Q4 2016. The bulk of the position was from H1 2015 at prices between $40 and $48. The five quarters through Q3 2016 had seen a combined ~50% selling at prices between $43 and $58. The elimination in Q1 2017 happened at prices between $62 and $66. Iqvia Holdings (previously Quintiles IMS): The large (top-five) ~6% IQV stake was purchased in Q1 2017 at prices between $75 and $82.50, and increased by ~70% the following quarter at prices between $78 and $91. The stock is now at ~$142. There was a ~17% selling last quarter at prices between $100 and $130, and that was followed with an ~8% trimming this quarter. Note: Mandel has a 3.8% ownership stake in Iqvia Holdings. Alibaba Group Holdings (BABA): BABA is a large 5.76% of the portfolio stake established in Q3 2016 at prices between $78.50 and $110 and increased by ~50% the following quarter at prices between $86.50 and $108. There was another ~50% increase in H1 2017 at prices between $88.50 and $144. The next quarter saw a reversal: a ~45% selling at prices between $141 and $191. The stock is now at ~$185. Last quarter saw a ~50% increase at prices between $156 and $198, while this quarter there was a ~36% selling at prices between $131 and $164. Activision Blizzard (ATVI): The fairly large 4.94% ATVI position was purchased in Q2 2016 at prices between $33 and $39 and built over the next three quarters at prices between $35.50 and $50. The stock is now at $41.88. Since then, the position has wavered. This quarter saw minor trimming. Note: ATVI had a previous round-trip: a ~2% position was established in H2 2015 and disposed in Q1 2016. Canadian Pacific Railway (CP): The 4.25% CP stake was established in Q2 2018 at prices between $173 and $195 and increased by ~36% last quarter at prices between $178 and $216. It currently trades at ~$206. This quarter saw an ~11% trimming. Transdigm Group (TDG): The 3.51% TDG position was purchased in Q4 2017 at prices between $256 and $285, and it is now at $429. Q2 2018 saw a ~25% increase at prices between $301 and $346. There was a ~14% selling this quarter at prices between $312 and $372. ServiceNow Inc. (NOW): NOW is a 3.18% stake established in Q2 2017 at prices between $84.50 and $118. Q4 2017 saw a ~22% reduction at prices between $113 and $131. There was another one-third reduction next quarter at prices between $132 and $175. The last two quarters had seen a combined ~18% increase at prices between $158 and $205, while this quarter saw similar selling at prices between $157 and $196. The stock is now at ~$236. PayPal Holdings (PYPL): PYPL is a 3.28% position established in Q3 2017 at prices between $53 and $65 and increased by ~40% the following quarter at prices between $64 and $79. Q2 2018 saw an about-turn: a ~40% selling at prices between $71.50 and $86. The last two quarters have also seen minor selling. It currently goes for ~$97. Mercadolibre Inc. (MELI): The MELI position was purchased in Q3 2017 at prices between $233 and $292. Q2 2018 saw a one-third increase at prices between $285 and $355. At the time, it was a medium-sized ~3.5% stake. Last quarter there was an ~18% trimming at prices between $295 and $385, and that was followed with a ~75% selling this quarter at prices between $258 and $370. The stock is at ~$468, and the stake is now very small at 0.89% of the portfolio. Amazon.com: AMZN is now a top-three 7.54% of the portfolio stake. It was established in Q4 2017 at prices between $957 and $1196. There was a ~25% selling in Q1 2018 at prices between $1189 and $1598, and that was followed with a ~40% reduction over the next two quarters at prices between $1372 and $1751. This quarter saw the position doubled at prices between $1344 and $2004. The stock is now at $1692. UnitedHealth Group: The large (top-five) ~6% UNH stake was established in Q2 2017 at prices between $164 and $187 and increased by ~160% the following quarter at prices between $185 and $200. The stock is now at ~$241. There was a ~27% reduction last quarter at prices between $247 and $270, while this quarter there was ~19% increase at prices between $233 and $286. Facebook Inc. (FB): The large 5.92% FB stake was first purchased in Q3 2014 at prices between $66 and $79. The position has wavered. In recent activity, Q1 2018 saw a ~75% stake increase at prices between $152 and $193, while next quarter there was a ~56% reduction at prices between $155 and $202. The last two quarters have seen a stake doubling at prices between $124 and $218. The stock is now at $171. Note: FB has seen a previous presence in the portfolio. Around 11M shares were purchased in Q4 2012 at prices between $19 and $29. The stake was disposed of in 2013 and early 2014 at much higher prices realizing huge gains. Constellation Brands (STZ): STZ is a large 5.62% stake established in Q3 2015 at prices between $115 and $131. The following three quarters had seen a combined ~40% increase at prices between $125 and $164. Since then, the position has wavered. This quarter saw a ~20% increase at prices between $157 and $229. The stock is now at $168. CSX Corporation (CSX): The ~4% CSX stake was established in Q4 2017 at prices between $48.50 and $58 and increased by ~17% next quarter at prices between $50.50 and $59.50. The stock is now at $72.46. Last quarter saw a ~30% selling at prices between $64 and $76, while this quarter there was a marginal increase. Note: CSX has had a previous round-trip. A 2.86% CSX stake was purchased in Q1 2017 at prices between $36 and $50. The following quarter saw a ~28% reduction at prices between $46 and $55. The remaining stake was eliminated next quarter at prices between $48 and $55. TransUnion (TRU): The 3.51% TRU position was purchased in Q2 2017 at prices between $38 and $49.50. The stock is now well above that range at $64.95. Q2 2018 saw a ~14% selling at prices between $55.50 and $73, and that was followed with a ~3% trimming last quarter. There was a minor increase this quarter. Note: Lone Pine Capital has a ~5.4% ownership stake in TransUnion. Wynn Resorts (WYNN): WYNN is a ~4% position purchased in Q3 2017 at prices between $125 and $149 and reduced by ~50% the following quarter at prices between $140 and $170. The last three quarters had seen a ~470% increase at prices between $125 and $201. The stock is now near the low end of their purchase price ranges at ~$124. For investors attempting to follow Mandel, WYNN is a good option to consider for further research. Note: Lone Pine Capital controls 5.4% of the business. Sea Limited ADR (SE) and Nio Inc. (NIO): These two minutely small (less than ~0.30% of the portfolio each) positions were left untouched during the quarter. Disclosure: I am/we are long BABA. I wrote this article myself, and it expresses my own opinions. I am not receiving compensation for it (other than from Seeking Alpha). I have no business relationship with any company whose stock is mentioned in this article.